Is the largest town on the peninsula and was founded in 1871. 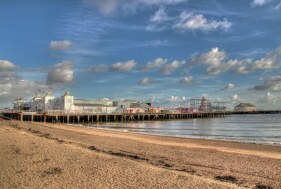 However nearby Great Clacton was established by The Celts around 100 BC with traces of the Romans using the area as a seaside retreat. Since the 1960’s the town became a thriving seaside resort and it continues to be popular today as a holiday and retirement destination. As you would expect there is a Pier, sandy beaches and delightful gardens along the seafront promenade and the town centre serves the many visitors and around 50,000 local residents On the outskirts of the town there is also shopping village. Close by there is also golf courses and a local airfield.